Which Sonos speaker is best for you? | What Hi-Fi? Beam or Bar or Base? One or Play:1? If you’re thinking of venturing into multi-room audio, the chances are you’ve considered Sonos. And why not? Over the last decade or so, the company has almost single-handedly shaped the wireless multi-room market into what it is today and, thanks to its competitive sound, vast array of streaming service support, voice control and set-up simplicity, it remains one of the most compelling wireless streaming solutions out there. Even with Audio Pro knocking at the door. But while the core products in the Sonos family – Play:1, Play:3 and Play:5 wireless speakers, the Playbar and Beam soundbars, Playbase soundbase and Sub, plus the Sonos One smart speaker – all share the same DNA, it’s more than just price and size that distinguish each product. Your particular needs will determine which one(s) you should buy, and we’re here to help guide you on your way. Sonos Beam vs Sonos Playbar vs Sonos Playbase: which is better? Sonos's newest product is a small soundbar (about 60% smaller than the Playbar) that delivers one of the best sound-for-pound performances we've heard from a product of its kind. Chunky weight, clear dialogue and a rich, big-scale sound that belies its smaller size, and with all of Sonos's streaming features for just £399? Not bad at all. The Beam features four full-range drivers, three passive radiators and one tweeter, but the headline features are an HDMI ARC connection (finally! ), Apple AirPlay 2 support, and integration of Alexa and Siri voice assistants. Why should you buy the Beam? The compact dimensions are ideal for those who can't fit the larger Playbar into their homes, and we've no doubt getting the full spectrum of Sonos's multi-room and streaming features for a more affordable price will be hugely popular. And it has HDMI. Also, it sounds great. Sonos’s answer to the growing trend of smart speakers is a revamped Play:1 with Amazon’s Alexa voice-control built in - and it passes its smart test with flying colours. It's not the very best-sounding smart speaker out there (that's probably the Apple HomePod), but the One's solid, detailed, spacious and organised presentation is identical to the excellent Play:1, and its Alexa is as seamless to use as on Amazon’s own speakers. It has the crucial feature of being able to use Alexa to control Spotify, and it even supports AirPlay 2 and Siri, with Google Assistant due soon. The One is easily the most well-specified and versatile smart speaker currently around. Why should you buy the Sonos One? You wouldn’t buy the Sonos One just for its AI smarts. But it's a great perk that's hard to ignore. 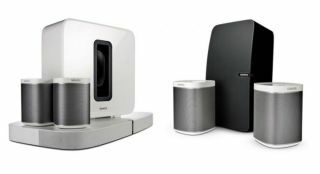 If you want a good-sounding wireless speaker that’s your stepping stone into the world of multi-room streaming (especially of the convenient, feature-packed Sonos flavour) that just happens to have the added bonus of voice-control – all for a very affordable £199 – then yes, the One is the one for you. The Playbase is quite simply a Playbar in the form of a soundbase. Stylish yet sturdy enough to plonk your telly on top, the Playbase makes perfect sense if you don't fancy using a soundbar. But this Sonos product isn't flawless. Despite its huge, airy soundstage and energetic, solid bass (which sounds more natural than the Playbar) there's a sibilance to the treble that can be hard to ignore. It's punchy and dynamic, though, so we'd recommend giving it a try before you buy. It's a breeze to use when going multi-room and you still get access to all those streaming smarts, but like the Playbar below, the lack of HDMI connections is something worth bearing in mind. Why should you buy the Playbase? The Playbase isn't perfect, but the core Sonos features we love - its ease of use, the extensive streaming features, the great app - are all present. It's a sure step up from your flatscreen TV's sound, and there isn't any other soundbase that packs in so many useful features into one streamlined box. While the Play:1 and Play:3 are still knocking around in their original guises, the Play:5 had a hefty update in 2015 – all for the better (even if we knocked it down to four stars recently). An enclosed chassis, redesigned drivers, touch-sensitive controls and the ability to position the speaker both horizontally and vertically were all welcome changes. It sounds better than its mark one version, and is of course bigger-sounding than its smaller siblings. The scale is huge, and the sound is packed with lively dynamics, rich basslines and an attention to detail that makes it fun to listen to. Why should you buy the Play:5? The Play:5 remains Sonos's biggest and boldest wireless speaker - but it's no longer the best in class, not when Audio Pro's Addon C10 sounds better for less money. But if you're building a Sonos system and want a big sound from one box , the Play:5 will do a fine job. The Play:1 is the brand’s entry-level speaker and the perfect starting point for those tight on space or budget. Around the size of a bag of sugar, it can fly solo or be paired with another (for a multi-room set-up, or in stereo mode), and gets you everything the Sonos experience has to offer: access to streaming services, including Spotify, Apple Music, Tidal, internet radio and more - all streamable through the intuitive Sonos Controller app, via wi-fi or Ethernet. Sonically it belts out music with more weight, solidity, punch and power than you’d expect from its humble proportions, making it one of our favourite wireless speakers at this price. Why should you buy the Play:1? A neatly packaged, good value speaker, the Play:1 is great for laying the foundations for your Sonos journey or for cost-effectively expanding your existing system into more rooms. Just be aware that, unlike some portable rivals such as the Ultimate Ears Blast, the Play:1 isn’t battery-powered and there's no smart voice assistant inside. Sonos in a soundbar. Essentially, the Playbar offers the same core functionality and streaming features of its speaker siblings, but can also connect to your TV (via digital optical cable only). It's the older sibling to the Playbase (above). As you’d expect, its room-filling presentation is a huge improvement over a TV's sound, offering weight, solidity, dynamics and bass depth that can be made all the more impactful when a Sonos Sub (£700) is added to the mix. As its size suggests, it offers a greater sense of height and a bigger spread of sound than the smaller Sonos Beam (above, top). If you want a more enveloping sound, any of the other wireless speakers can be paired with the Playbar to act as surround channels for a full 5.1 set-up. In this set-up, it can decode Dolby Digital and produce pseudo-surround from a stereo signal, but can't handle DTS or higher quality soundtracks such as Dolby TrueHD. Why should you buy the Playbar? The Playbar isn’t cheap, and the Dali Kubik One may give you better audio performance, but the fact it delivers TV sound and the Sonos music streaming package puts it in another league to anything else on the market. If that’s what’s important to you, and a space-hogging surround system isn’t practical, the Playbar is hard to ignore. Surely the Play:3 is the next speaker to get an update? Originally reviewed in 2011, the Play:3 made waves by matching its smaller sibling for features but offering bigger, better sound. There's an extra speaker driver and bass radiator, which helps bring more bass weight and depth, as well as extra volume and power. Unsurprisingly, its trapezoidal chassis has a larger footprint than the Play:1, measuring 13 x 27 x 16cm (HWD) and, thanks to rubber feet and automatic EQ adjustment, it can be orientated vertically as well as horizontally for a more natural look if two are paired in stereo. Why should you buy the Play:3? It looks old next to the newer, stylish products, but the Play:3 performance over its smaller sibling is worth the extra dosh - especially now it's come down in price. And with the dispersion and power to fill a larger space, you get a living room-friendly speaker without having to spend a small fortune. The great thing about Sonos is not only its wide range of products, long list of streaming services, and user-friendly app and set up. It’s also that your system can constantly grow - whether that's through adding wireless speakers to your soundbar set-up or planting them in another room. And if you want to add voice control into the mix, it's a seamless process. While no longer compulsory, we would recommend anyone committed to the multi-room cause to hardwire at least one (a ‘master’) speaker to your network router, so you can take advantage of the proprietary peer-to-peer mesh network that makes Sonos so reliable. Alternatively, the more powerful Sonos Boost (£99) is designed to make your wi-fi signal twice as robust - ideal for large houses and thick walls. Why should you buy the Sonos multi-room system? As an entire ecosystem, Sonos is hard to fault - if you don’t mind sacrificing high-resolution audio support, of course. Sensibly priced, beginner-friendly and with an appealing expand-as-you-go ethos, it’s a multi-room mogul to be reckoned with. Of course, Sonos is now far from the only option when going multi-room. The company may have been first but big players such as Bose, LG, Samsung, Sony and Yamaha, and hi-res supporting brands such as Bluesound and Denon, have since joined the fray. The increasingly popular (and cheaper) smart speakers from Amazon and Google also offer multi-room streaming across their various voice-controlled products, while the Apple HomePod now has multi-room powers thanks to AirPlay 2 (which Sonos also has in select products). While most rivals may not have been able to topple the multi-room giant, newcomers such as Audio Pro have shown it is possible to deliver better sound for better value. Check out our full Sonos guide for everything you need to know about the company's speaker ecosystem and its alternatives.